View from Dumbo waterfront, near our new studio. So much has happened this past year. It’s hard to believe that it’s only been 12 months since I officially started Distill Creative! What started as a gathering in my living room with my sister and friends over four years ago has turned into a real, money-making business. We had a busy 2018 and I cannot wait until 2019! My previous job was Placemaking Manager for Vornado/JBG Smith focused on Crystal City, VA, which is now one of the Amazon HQ2 sites. This is a photo from a supper club series I designed, one of many projects that were part of my placemaking strategy. I ended 2017 by quitting my corporate job in real estate and committing to being a creative business woman and artist. I took a few months to do a self-guided art residency in Oaxaca, Mexico and then moved to New York City in early 2018. During this time, I decided to change the name of our workshops, which used to be cocktails+craft, and create a new business that incorporates the craft workshops, private events, and consulting services. It took me months to think of new name, but with the help of my sisters and my boyfriend we finally came up with something I love: Distill Creative. This is the first time I met these friends in Washington, DC. Moving to NYC was not easy. Finding an apartment was stressful and early 2018 was frustrating because it was so cold and I was terrified of doing what I do in a new city where there is so much more competition and so many talented people. I spent years seeking out inspiring creatives in Washington, DC, and every other city I’ve lived (San Francisco, Los Angeles, Bilbao, Spain, Phoenix). The thought of having to start all over again was daunting. But, I knew from experience that it will pay off, it just takes time and it takes putting yourself out there. When I finally started doing that things started picking up speed! Opening party at Eche Verde. Early in 2018, my boyfriend and I shared a retail space and tested doing a mixed-use concept of having a shop in the front (Eche Verde), workshops in the back, and an office in the middle for our two businesses (Distill Creative and JPG Legal). It was working well, but the space was tight and when my boyfriend needed to hire his first employee we realized we really needed more space to continue doing what we wanted to do. We found a really amazing loft office in Dumbo, Brooklyn and moved our retail shop to be online only, for now. Now, we can host bigger workshops and I have more space for research and development of new craft experiences. In 2018 we had our first Distill Creative Chapter Leader retreat and we’ll be starting two new Distill Creative Chapters this year! I’m super excited to see how each Chapter celebrates creativity in their own communities. We have Nicole Schroeder in Southern California, Shenneth Dove-Morse in Washington, DC, Victoria Crispo in Staten Island, NYC, and Amelia Favere in Reston, Virginia. This past year I also started hosting private events and creative experiences in NYC. We had been hosting workshops and events in DC, but starting in NYC has been a huge step and it has been really amazing. I love working with different brands and creating unique experiences at events and parties. This past year I also started hosting airbnb experiences this year, which as been really fun and a great way to meet people from around the world. I also have been hosting workshops for Creative Morning Field Trips, CourseHorse, and Culture Night, which has been really fun and has helped me meet people in New York. On the consulting front, I’ve worked on some interesting projects as a consultant curating and project managing site-specific art installations. Photo via @anavictoriana, author of Creative Watercolor and host of our first Master Class in the new space! 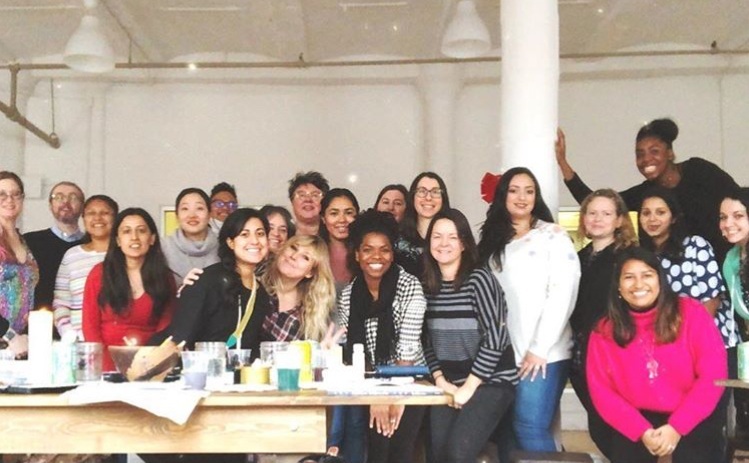 At the end of 2018, we hosted our first master class in our new space -- a Creative Watercolor workshop and book launch with Ana Victoria Calderón. It was so nice to have a packed house of watercolor artists in the room! I cannot wait to host more master classes in our studio! Me with a giant paper flower (one of my favorite crafts) on my head. While I’ve had a lot of changes this year and tested a lot of ways for Distill Creative to continue to grow as a business, I’m thankful to do what I love best: creating and inspiring others to create. Every time I get to develop a new craft project or make a mood board for a new client or do research on artists for a new project, I get really excited and think “I love my job!”. At times it is scary and frustrating and overwhelming, but it’s worth it to create my own dream job.